You should really start looking into construction and infrastructure jobs. Do it for yourself. Who doesn’t want to learn new skills every day while earning $50,000 outside the shackles of corporate drudgery? But also, do it for your country. President Donald Trump has promised to pursue a $1 trillion infrastructure plan in the coming years. The move comes in the same year as a harrowing derailment and flaring frustrations with the largest public transit system in the U.S., and the fiery collapse of a highway overpass in one of America’s largest cities. There’s a great example of a major infrastructure project just down the road from The Penny Hoarder’s office: A $971 million master plan expansion at Tampa International Airport. Tampa International Airport Communications Manager Danny Valentine points to where the new rental car facility is being built. Heather Comparetto/The Penny Hoarder. Atlanta-based Cleveland Electric Co., one of hundreds of contractors on the project, has logged 175,000 hours so far — and this project is just a taste of countrywide construction spending. Since the economy bottomed out in 2011, overall construction spending has jumped 50.4% to more than $1.1 trillion in 2016, according to estimates provided by the U.S. Census Bureau. The need for this work is there — but the workers aren’t. 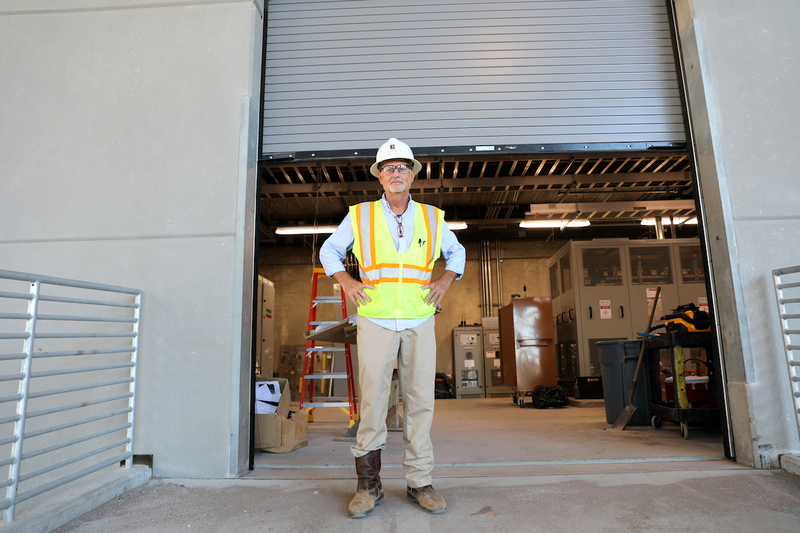 A worker is pictured in the interior portion of the new rental car facility that’s currently being constructed at TPA. Heather Comparetto/The Penny Hoarder. The next generation of builders is making a good living without the burden of thousands of dollars of student debt. Take Danny Elmore. Within 15 minutes of talking to Elmore, who is the field superintendent of Cleveland Electric, he nearly had me convinced to quit my job and and become an electrician. The 57-year-old journeyman electrician has never looked back. As with a lot of jobs in the infrastructure and construction sectors, you start as an apprentice and spend three to five years working your way up to become a journeyman electrician, Elmore explained. Even better, you get paid for the work you do while learning on the job. Elmore said the work is rewarding and you get to work outside with your hands — not to mention the six-figure pay he now earns annually. Danny Elmore talks to Penny Hoarder writer Alex Mahadevan about how rewarding his profession is. Heather Comparetto/The Penny Hoarder. Indeed, Elmore said he lives a comfortable middle-class life and is essentially in charge of his own destiny when it comes to taking on jobs. He had a little car trouble last week, but it’s a company vehicle they’ll take care of fixing — another perk in the life of a qualified electrician. Elmore has worked on everything from train stations, to airports, to hospitals to schools. But even without a big push in public infrastructure spending, there are a plethora of jobs out there. He worked for three years on a Google Data center beginning in 2012. Right now, he’s hard at work on a portion of the expansion at Tampa International. Cleveland Electric is overseeing the electrical side of the SkyConnect people mover that will connect a rental-car facility with the terminal. A worker works on the new SkyConnect track that’s being built at Tampa International Airport. Heather Comparetto/The Penny Hoarder. Elmore, as part of a 120-person team (now down to 80 as the job nears completion), is placing 130 miles of copper cable, 40 miles of fiber optic cable, seven miles of power rails and 3.8 miles of cables, according to Tampa International Airport Communications Manager Danny Valentine. As Elmore walks through a concrete room stacked with 14,000-pound transformers and miles of colorful cables, he pulls one-year apprentice Michael McCarthy off the job to ask his hourly rate. About $13 — 63% more than Florida’s minimum wage of $8.10. McCarthy, 23, didn’t go to college and spent the last few years serving tables or working at Dunkin’ Donuts. Now he’s on the same track Elmore started in the 1980s. “Most of the people I know who went to college are moving back in with their parents now,” McCarthy said.